Edwards had had affairs with other women on the campaign trail. When Edwards was forced to call off a birthday date with Hunter because he found out that Elizabeth’s cancer had returned, an unsympathetic Hunter screamed at him. After learning of the affair, Elizabeth made John sleep in their barn though she would wake him up with accusatory rants. Hunter relied on a California psychic named Bob to tell her where to live and what to do. Edwards had little affection for John Kerry – once comparing him to Richie Rich – but changed his tune when the Democratic presidential nominee tapped him as his running mate. Ted Kennedy once told Young about a would-be assassin who managed to get into his Senate office because one of his bodyguards was having a gay liaison with one of his top aides. 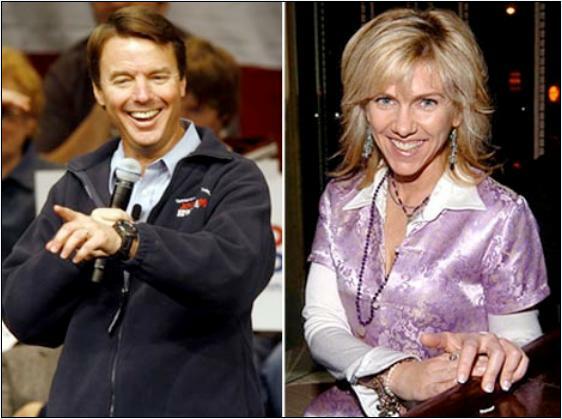 With regards to the item on Kerry, it has been clear since the 2004 election that John Kerry does not think much of John Edwards. In what was generally a very disappointing week of premiers for new shows, there was one excellent pilot. FlashForward was by far the best pilot I saw. While the concept is taken from Robert Sawyer’s novel, the actual storyline is entirely new. One significant difference from the concept of the novel is that rather than having everyone on earth flash forward to years in the future, the flash forward in this show takes place to April 29, 2010 at 10pm Pacific Time. This leads to a different type of story, presumably dealing far more with the daily lives of the individuals involved. Among the characters whose lives might be changed by seeing six months into the future, Sonya Walger plays Olivia, a doctor and a wife who seems far more likable than the bitchy wife she played on HBO’s Tell Me You Love Me. In Walger’s flash forward she sees that she is intimately involved with a man who is not her current husband. At the end of the first episode is is obvious she will meet the man very soon as she is the father of a child she was treating (and who knew her name, presumably from the child’s own flash forward). The presence of Sonya Walger, who also plays Penelope Widmore on Lost, isn’t the only comparison between FlashForward and Lost. The chaos in the scene after everyone lost consciousness is reminiscent of the chaos after the crash of Oceanic Flight 815 in the pilot of Lost. 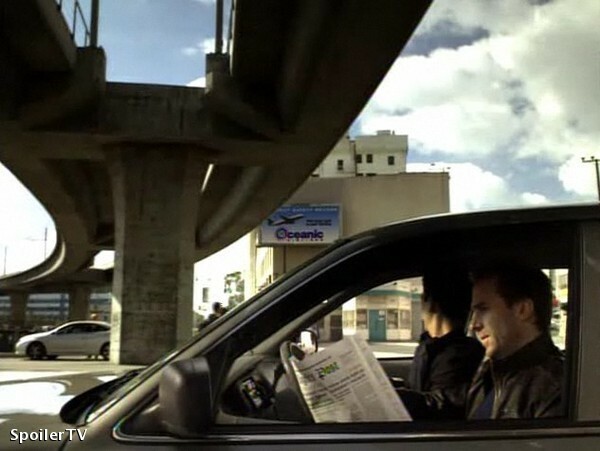 While the above screen capture isn’t clear enough to see the details, one scene showed a billboard for Oceanic Airlines in the background which noted their safety record. Is this show taking place in an alternative timeline where the bomb at the end of last year’s final episode of Lost was successful in changing history and the crash did not occur? It created a big enough mystery at the end to see the one person awake in the video from a stadium in Detroit when everyone else was blacked out. Was this person from the Dharma Initiative? We know what the ultimate season is and the penultimate season is. For in between, we know the various seasons but we are treating it like an accordion. In success, [the show] can go seven years. In less success, it would need to go three years to work. The end game of the show, to be properly done, really requires two full seasons focusing on the end game. 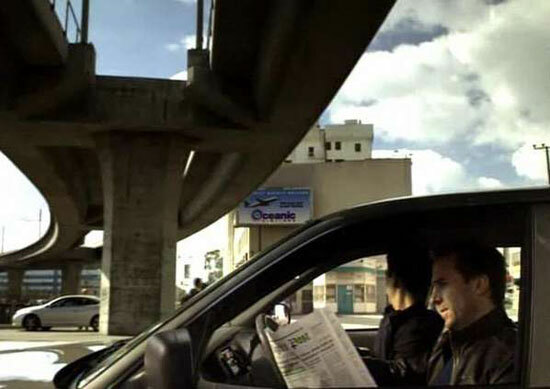 The pilot also included a commercial for the other eagerly awaited science fiction show of the year–the remake of V. A promo for the show appears above. There have been rumors of production problems with the show for a while, and now Variety reports that they are going to divide the series. The show will go on hiatus after the first four episodes, saving the final nine for later, probably resuming in mid-March. There are claims that this is to avoid competition from American Idol and the Olympics but it would seem like a show has a better chance to succeed without such a hiatus. Dexter resumes tonight but, as with previous seasons, the first episode of the season has been available on line. I assume they intentionally leak out the first episode every year to create buzz for the show, but I wonder why they don’t simply air the show on demand as opposed to encouraging such down loading. 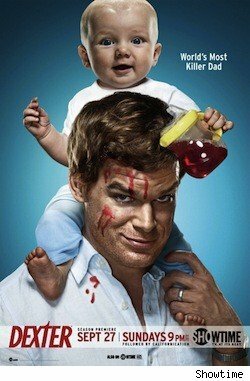 I won’t say anything to spoil tonight’s episode, but it does deal with the complications for Dexter from having a wife and baby. 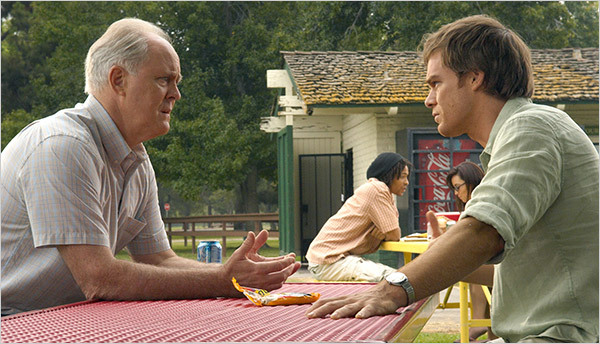 The episodes also ends with a mini-cliff hanger which gets to the question as to whether it is safe for Dexter to pursue his activities. Q. John, what was your reaction when you were approached to portray a madman who kills in multiples of three? MR. LITHGOW I felt like, “Oh, yeah. I know how to play this.” The fascination — which is the fascination of the whole series — is: How can a person outwardly so ordinary, almost bland, have such a baroque and bizarre secret life? I’m usually hired for my blandness. [He laughs.] I love the idea of shocking people. I thought it was high time I did that again. Q. Here’s your essay question: Compare and contrast your individual serial killer characters. MR. HALL Well, they’re obviously both saddled with a compulsion. They’re different seeds from very different trees. For Dexter’s part, I think it’s an awareness that Trinity does what he does, and it makes him compelling the way no one has ever been to him — other than perhaps his brother. With Couple’s Retreat coming out on October 9, the internet is being flooded with pictures of Kristen Bell and Kristin Davis in bikinis and lingerie. While not a bad way to end the summer, this is a waste of Kristen Bell’s talent as seen in Veronica Mars. “It’s ridiculous.” says Snyder. “We are friends helping friends!” She added that she accepts no money for babysitting. State Representative Brian Calley is drafting legislation that would exempt people who agree to care for non-dependent children from daycare rules as long as they’re not engaged in a business. “We have babysitting police running around this state violating people, threatening to put them in jail or fine them $1,000 for helping their neighbor (that) is truly outrageous” says Rep. Calley. A DHS spokesperson would not comment on the specifics of the case but says they have no choice but to comply with state law, which is designed to protect Michigan children. Can we pass a new law which says that stupid laws should not be enforced? I also wonder who filed the complaint. They were hardly being a good neighbor.